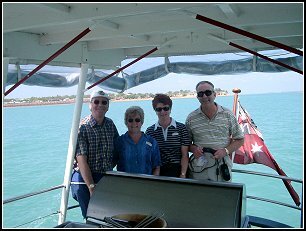 In the summer of 2002 we joined our friends Alan and Pam to explore the Red Centre of Australia. 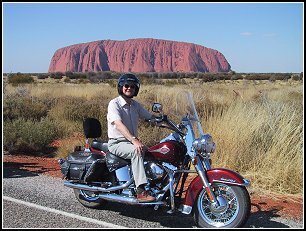 Organised tours are not usually our preference, but as none of us had any experience of the area and mindful of the very large distances involved, we chose an itinerary offered by Scenic Tours. It proved to be a wise choice. Here are a few of the 400 digital photographs taken by Elsa and me, together with some of our impressions. Position your cursor over each photograph for a caption.  They have been scaled down from their original 1,600 x 1,200 pixels to reduce loading time; if you would like to see a full size copy then please contact me. Our journey began in Sydney. Initially there were just twelve of us, but this rose to 26 as others joined us later in the tour. Our well-appointed coach seated 48, so we enjoyed cosy but uncluttered travel. Discovering that we were the only Poms aboard, our driver and guide Kevin began a good-humoured dialogue with us that entertained everyone throughout the trip. Our tour director Rosy was a Kiwi, and her easy manner helped to make the trip an enjoyable experience. 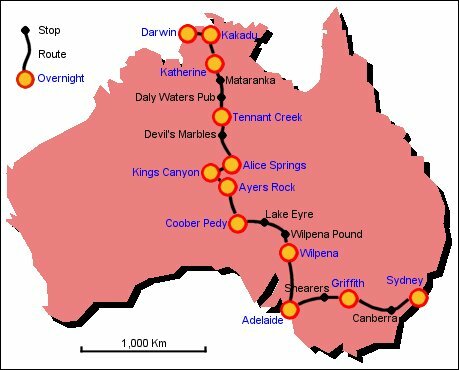 The first two days were essentially getting us to Adelaide, the effective starting point for our trip into the Outback. Despite the long distance, around 1,500 kms, we managed some fascinating stops along the way. 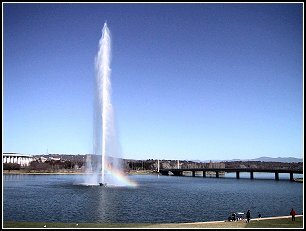 Canberra is an unusual city, purpose built as the nation's capital in the middle of nowhere to satisfy the competing claims of Sydney and Melbourne. The result is a well-planned and elegant centre with many unusual buildings. However, it seems to lack the spark and life of its larger neighbours, and you are left with the feeling that you are visiting a civic park rather than a capital city. But a place largely populated by civil servants is unlikely to be fun city! Our second day included a visit to the Shearers' Hall of Fame at Hay, dedicated to the sheep shearers that helped establish Australia's wool industry. It proved a captivating insight into both the process and politics of harvesting sheep wool. This surprisingly well organised activity had a piece-work regime that encouraged productivity but discouraged change. 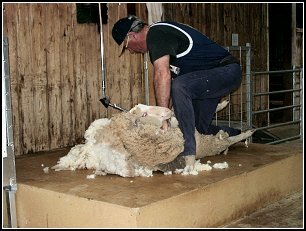 When the Kiwi shearers arrived with a wider cutter doing a faster job the locals were unhappy, but eventually accepted the inevitable. Despite many technological advances shearing has hardly changed in a hundred years, and daily records set generations ago still stand. The practical demonstration was fascinating, but the sheep must have been cold afterwards with the temperature barely 12°C. Having been out in the sticks it came as quite a shock to encounter the traffic of Adelaide, guarded as it is by countless sets of traffic lights. 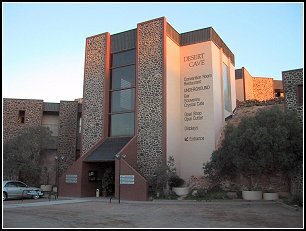 However, this was compensated for by our magnificent art deco hotel, with spacious accommodation and traditional service. 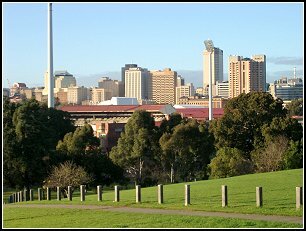 Adelaide reminded me of a well-kept southern English town - spotlessly clean, manicured lawns in the parks, busy but relaxed, with little sign of poverty or decay. We saw so little of it, but I imagine it to be a place where I could enjoying living. Leaving Adelaide we made our way north into the Outback proper. I had imagined the roads to be dusty and straight, the countryside empty and featureless, but this is not always so. The main roads are tarmaced (blacktop in 'Strine), the terrain is continually changing and there are a surprising number of hardy souls prepared to live miles from anywhere. 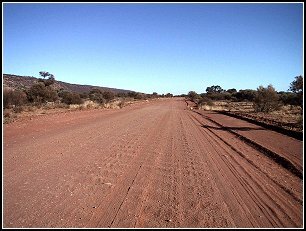 However, once off the main drag the roads are usually dirt with spine-jarring holes and corrugations, and sometimes you will not need to negotiate a bend for as much as forty kilometres. Traffic is generally light, sometimes as much as fifteen minutes between vehicles. 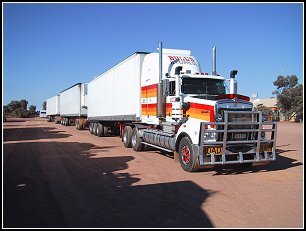 The transport of choice is naturally the 4x4, and freight is moved in road trains of three or four sections. 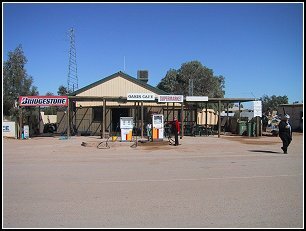 With long distances between diners, toilets and fuel you fill and empty whenever the opportunity arises. Some wayside facilities can appear very primitive, but inside they are mostly well-appointed. 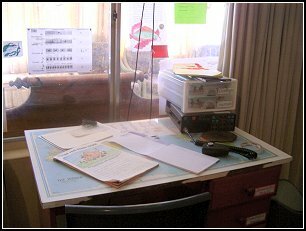 I discovered an 'Internet Cafe' in one offering ten minutes surfing and email for $A2.50; not bad considering the nearest ISP is probably 1,000 km away! We spent our first Outback overnight at Wilpena in the Flinders Ranges National Park, a spectacular series of escarpments and gorges teeming with wildlife. 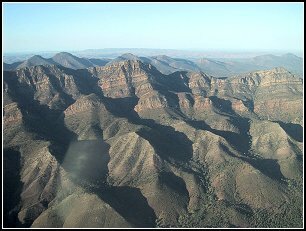 We had time to take a flight over the famous elevated basin of Wilpena Pound, which provided the early ranchers with a huge natural corral for their cattle. The scale of the terrain really came to life from the air with the rugged mountain wilderness seeming to stretch for ever, and our tiny single engine aircraft just a fly on its back. That evening we dined well in front of a huge fire (desert winter evenings are close to freezing) and watched the kangaroos browse the hotel compound. A first class hotel with all the usual amenities, tastefully hidden in the middle of nowhere, is no mean feat. 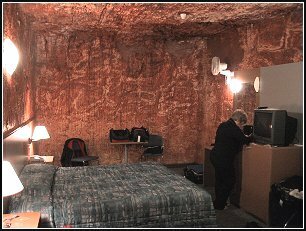 The desert town of Coober Pedy is one of the harshest inhabited places in Australia, with summer temperatures frequently in the fifties centigrade. Its attraction is opals, producing some seventy percent of the world's supply. Many homes, and our hotel, were carved into the rocky hillsides to provide a comfortable environment of 24°C all the year round without any heating or cooling. 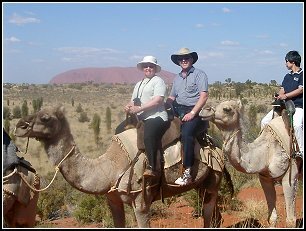 Now universally known by the Aboriginal name of Uluru, Ayers Rock is every bit as big, red and awe inspiring as its pictures. Most visitors attempt the climb to the summit, but it is fiercesomely steep and exposed causing many to give up. We opted to walk round part of the base instead and try to make sense of the ancient rock paintings. Viewing it from ground level it is difficult to appreciate the grandeur of this single piece of rock, especially when dotted with tourists. We saw it again at dawn from a helicopter, before the visitors arrived, and marvelled at its isolated majesty. It is easy to understand why the indigenous people regard it as a holy place and would prefer it to remain undisturbed - but then we would have missed one of the world's great spectacles. The highlight of our stay was a magnificent dinner served in the desert - the Sounds of Silence - starched white tablecloths and napkins with all the trimmings, a menu including buffalo, kangaroo, crocodile and emu washed down with red and white wine and lots of champagne. We have little recollection of the astronomy lesson, just a warm rosy glow about the whole experience! 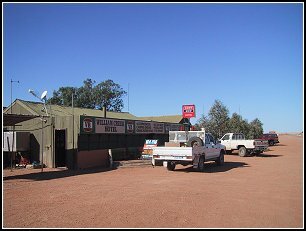 The town of Alice is effectively the capital of Australia's Red Centre. Not very big but boasting most of the amenities you would expect, it provides an ideal base for touring the area. 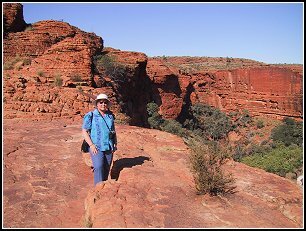 We visited Kings Canyon, the Desert Park, Palm Valley and enjoyed an evening of Aboriginal music. 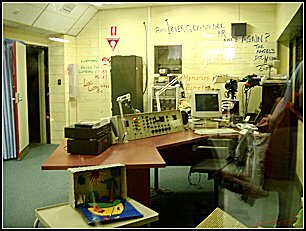 On our final morning in Alice we toured the fascinating School of the Air, which broadcasts lessons to 140 primary school children scattered around the Outback. As we had already seen the remote classroom of two of its pupils in an isolated cattle station, the true value of this remarkable service became abundantly clear. 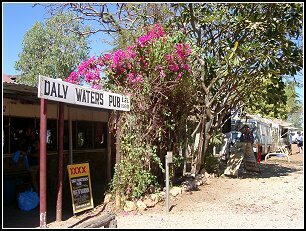 If you look at a map of Australia you may well see a place marked Daly Waters between Tennant Creek and Katherine. You might reasonably expect it to be a town of some significance. 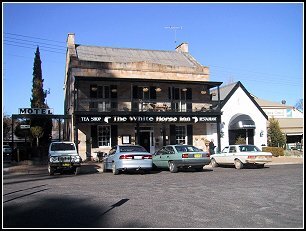 It is in fact just a pub. It was surprisingly (?) busy for probably the remotest one on earth. We enjoyed a traditional Aussie seven course lunch there - six beers and a pie! It has a microculture all of its own, and I could have explored it for hours. The sign I enjoyed most: To all dogs and dingos - last lamp post for 500 km. As we travelled further north the climate became steadily hotter. Although early mornings could be quite chilly, even in bright sunshine, by coffee time we were enjoying tropical temperatures in the thirties. 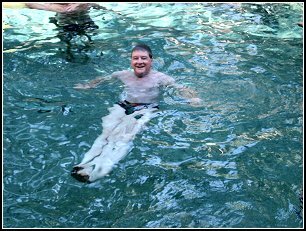 One of our more pleasurable moments was a stop at the Mataranka thermal hotsprings, where three of us had a delightful swim in the warm crystal clear waters of its natural pools. 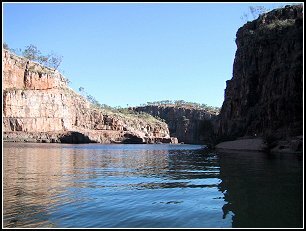 After an overnight in Katherine we took a magical boat ride through the Katherine Gorges, a captivating series of waterways providing natural oases of vegetation and wildlife in a sandstone wilderness. It is not surprising that this area is a favourite with film makers. There are not many countries in the world that can afford to preserve 20,000 square kilometres as a national park, but Australia's Top End has managed just that in Kakadu. 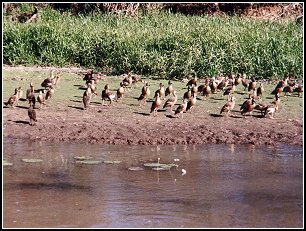 This enormous flood plain to the east of Darwin is maintained as a natural habitat for many species of birds, but most of all for its crocodiles. 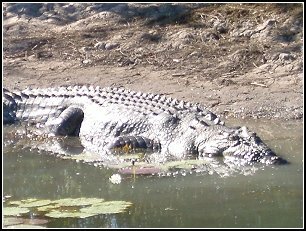 An early morning riverboat ride yielded slumbering crocs like mileposts at every turn, and more bird life than we have seen anywhere else on our travels. These massive primeval creatures, some we saw were fifteen feet long, snooze for hours half in half out of the water keeping an ever-watchful eye for their next meal. If something tasty ventures too close they take off like a sprinter out of the blocks, retiring for a post-prandial nap of several days so as not to disturb their digestion. Even our hotel was shaped like a crocodile. 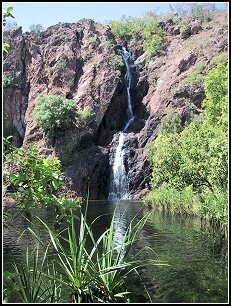 The Litchfield National Park has many natural surprises. 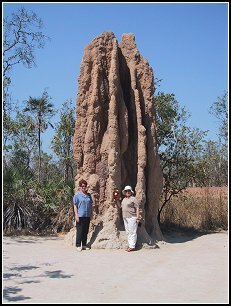 This giant termite mound beggars belief, and is surrounded by 'magnetic' mounds built flat east west to catch the sun. The waterfalls and catchment pools are full of fish, even out here in the wilderness. 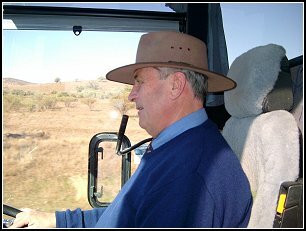 Despite the large deposits of uranium, the area has not been intensively mined or over commercialised - we were delighted, and so were the makers of Crocodile Dundee. Our final destination was Darwin, capital of the Northern Territories and focal point of the Top End. Over a third of the NT's population of 187,000 lives in the city, a beautifully clean and fast growing port destined to be a major freight gateway to Australia when the new railway is completed in 2004. 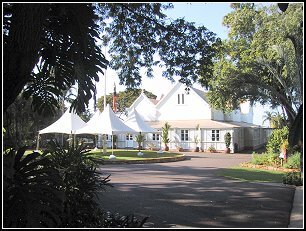 By happy chance Government House had its annual open day during our stay, and we were able to visit the state rooms where the British Royal Family had stayed and see the magnificent dining room used for official banquets. 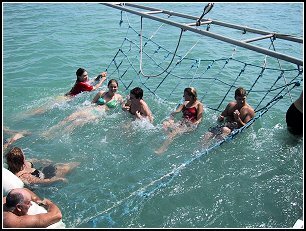 Our trip was rounded off with a lunchtime cruise around the harbour, using the deep sea lock and offering a good view of the sights (and the young swimmers!). It took us fifteen days and over 6,000 kilometres to drive from Sydney to Darwin, and just five hours to fly back. We had a great time and made lots of new friends. 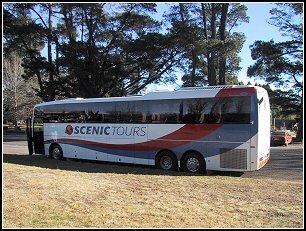 If you would like to repeat our Red Centre adventure then try Scenic Tours - they did a great job for us. Thanks, Rosy and Kevin.